I walked up and down the book aisles of Target. Back and forth. Scanning the shelves with remarkable care, even though every title is familiar by now. The Ice Cream Queen of Orchard Street. The Girl with the Lower Back Tattoo. Not to hate on these titles – I’m sure they’re good books, and I actually own the second one – but I’m sick of seeing them every time I go to Target. I wish they’d put some different books in stock for once. Give me some credit: I don’t have a real bookstore near me. Books-A-Million is a half hour away, McKay’s is further, and Barnes and Noble is even further. So, I go to Target. Oddly enough, it’s one of my favorite stores anyway. I’m having some Book Struggles. It’s capitalized because it should be a real thing by now, if that makes sense. Basically: I love the World War II era. Ever since I read Anne Frank’s Diary for school last year, I’ve been really into it. So I want to be immersed in my little piece of history whenever I can, and the best way to accomplish that is by the pure magic of a good book. I’ve read my fill of really good 1940s books. From the moving nonfiction of Corrie Ten Boom’s The Hiding Place to the dark, poetic fiction of Markus Zusak’s The Book Thief, I’ve loved them all. I could have a whole section of my bookshelf for my WWII stories. But here’s my Book Struggle: I can’t find a feel-good historical fiction. Forget that: I can’t find a modern, feel-good piece of fiction at all. It seems every happy book was written 20 to 200 years ago. A brief note: “happy” wouldn’t typically be a book criterion for me. I used to relish in sad stories. But I’ve been trying to keep myself as upbeat as possible lately, and the books I read have a big impact on my emotions. Okay, brief note over. Anyway: we experienced some irritation in the book aisle today. My mom – who is helping me with my Book Struggles – set her jaw and said, “We’re going to find you a book.” But a few minutes of browsing and reading back-cover blurbs later, her jaw fell loose again. I looked up from another unpromising book. The word “write” usually catches my attention, regardless of the context. But what my mom said was directly regarding me and my writing, so the book in my hand was totally forgotten. That may have been a plea to get me to stop writing such sad/intense stories, which she had referenced earlier that day. But regardless, I was inspired. I still am. We went back to the video game aisle to meet my siblings, and I did some thinking. The novel I’m working on is, indeed, a WWII historical fiction. (It’s ironic, now that I think about it.) But I could never quite figure out what I was going for; do I want a fun read that has the potential to become a classic, or a tale of war and growth through sadness? That’s the question that bounces around my mind at night. I managed to fall somewhere in the middle. I wasn’t satisfied. It isn’t good to be uncertain of what you want your book to look like, especially in my stage of editing. I never realized that I was literally writing the very book I wanted – it’s a WWII fiction that has southern tones, creative characters, and lots of cake. It screams me, and not just because I’m the author. Don’t see the book you want on the shelf (or in the Target book aisle, in my case)? Write it. Maybe spend some time jotting down everything you’re looking for in a novel, and either apply them to your current WIP or start a new book with your ideas. And in the meantime: if you’re looking for a feel-good read, like I am, I suggest nonfiction humor. Is Everyone Hanging Out Without Me? (And Other Concerns) by Mindy Kaling is a favorite of mine. But I miss fiction, so some book suggestions would be greatly appreciated! Hey, Sam. I can tell you’re really into WWII books, but are you a fan of fantasy as well? If that’s the case, check out Andrew Peterson’s The Wingfeather Saga. It’s a Christian fantasy series written for middle school age kids, but I’m almost 17 and absolutely love them! You can check them out here: http://wingfeathersaga.com/ And, they are working on an animated series as well! Hi, SlyLilHuntress! Thanks for the book suggestions! I checked out your link, and as it turns out, I own the first book in that series! I’ll have to find it again. 🙂 I used to read fantasy all the time, and it’s – by far – my favorite genre to write. Thanks for commenting! I did the same thing! I had the first book for a while, but it took me a while to get around to reading it and actually purchasing the others. In my opinion, the series gets a lot better after the first book. Plus, the series wasn’t even finished when I read them, so I had to suffer through waiting on Andrew Peterson to write the others! 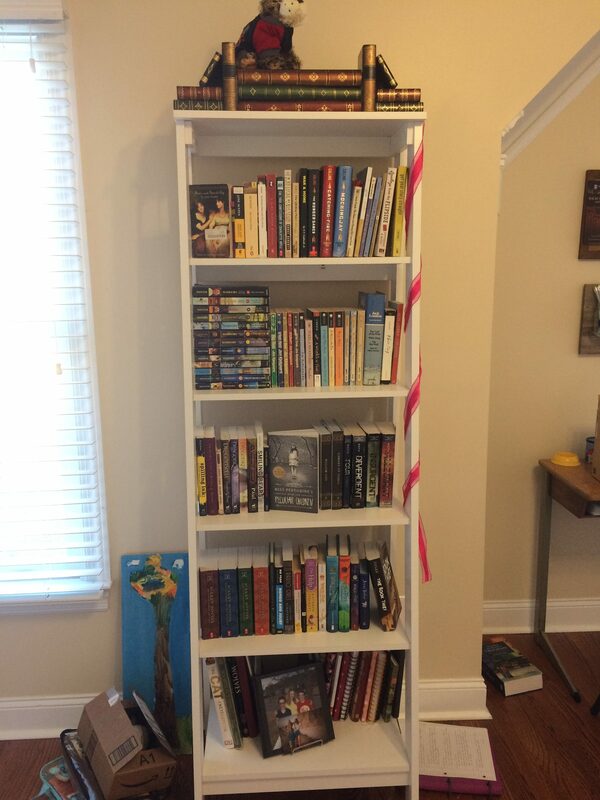 I remember my whole family was reading the first book together last year, but when we started moving we lost track. I think we got several chapters in, though! I’m looking forward to picking it up again. 🙂 I hate that feeling of waiting for the author to write the next books in a series; the anticipation is awful! But by the time it’s finally released, it’s one of the best feelings.